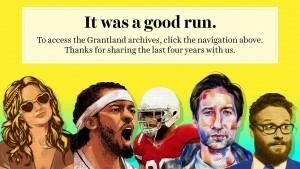 I’ve been thinking about it a lot, and — for me at least — I can’t think of pop culture event in a very long time that has made me sadder than the sudden killing of Grantland. Sure, some of my favorite TV shows have gone away. Goodbye Deadwood, so long Mad Men! Sure, bands break up and artists die. R.I.P. Lou Reed and R.E.M. And except for eight times in my entire life, my favorite teams aren’t going to be the World Champs. But there are always other TV shows and other musicians and wait ’til next year! But Grantland was unique. I realize that Bill Simmons is a polarizing figure, but his great insight — that there is an intersection between the pop culture nerd and the sports nerd — spoke directly to me. Every single god damned day for the past few years, I could go to Grantland and never know what I was going to find: Andy Greenwald or Molly Lambert writing about a TV show I should be watching, Steven Hyden raving about the latest punk rock band or country artist he’d discovered, Wesley Morris with some insight films, Jonah Keri breaking down the best teams in the MLB. Or all of the weird mash-ups and brackets and fake hot takes and deep insights. And the podcasts! At their height, I never missed an episode of The Hollywood Prospectus or Girls in Hoodies or Do You Like Prince Movies? For me, this is like like the ends of Trouser Press and Creem. Or like the cancellations of Police Squad!, Twin Peaks and The Middleman! Or like the deaths of Kurt Cobain and Warren Zevon. 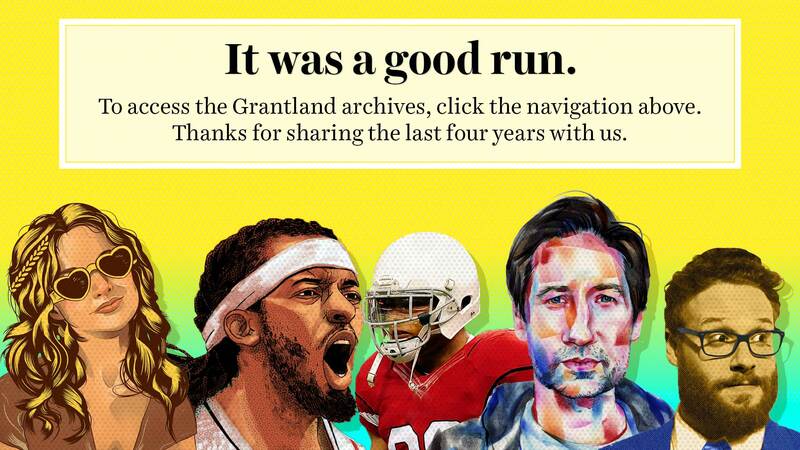 Like Grantland, all of these things were unique and unfinished. There was potential for so much more. And that’s what makes me sad. A few weeks ago, book designer Craig Mod released Bibliotype, an HTML template system that designers can use to explore typography on the iPad. Bibliotype is a thoughtful approach to designing typography for long-form reading on tablet devices. The template includes support for several viewing distances, portriat and landscape orientations, and a hyphenation library, among other features. If you’re a book designer looking to experiment with typography on tablet devices, Bibliotype will jump start your design process. What’s missing from Bibliotype is a way for designers to easily work with real content. If only there was some way to connect Bibliotype to a light-weight, user-friendly, content management system. Well, now there is. Presenting Bibliotype for WordPress. As a WordPress theme, Bibliotype becomes a framework for publishing beautifully designed books on the web for consumption on tablets. Point your iPad here to see the theme in action. Or download BiblioType for WordPress and start designing your own web-based book. I’ll be speaking about Open, Webby Book Publishing Systems at tools at O’Reilly Media’s Tools Of Change conference next week in New York City. Registration is still open, but probably not for long. The event sells out every year. If you’re planning on going register today and use the Medialoper code toc11med to save 15%. While the news from CES last week buzzed with updates about the latest Android tablets and stories of self-navigating iPad robots, a new product with the potential to further disrupt the already troubled book business went largely unnoticed. The ION Book Saver is a new scanning system designed to convert print books into eBooks at a rate of two facing pages per second. It’s fast. It’s cheap. And it has some in the publishing industry wondering if it’s a precursor to a new class of product that will one day enable consumers to digitize their book collections in much the same way they ripped their CD collections. Is Book Sharing Really a Threat to Publishing? Last week bookseller Barnes and Noble unveiled the Nook, its long-awaited eReading device. Although ill-named, the Nook is a worthy competitor to the Kindle, offering a number of features not found on the Amazon device, including LendMe, a feature that allows for controlled sharing of ebooks. While the sharing feature comes with a number of limitations, it would appear to be a small but important step towards making DRM-restricted content slightly more flexible for consumers. There’s just one problem — publishers want no part of the Nook’s LendMe feature. Publishers Lunch reported last week (registration required) that many large publishing houses have indicated that they won’t participate in the LendMe program. To be clear, the LendMe feature is extremely limited. Books are lent for a maximum of 14 days. And unlike the library, there are no extensions. When a book is lent, the lender loses access, and once the book is returned to the lender it can never be lent again. What Unnamed Publishing Executive seems to fear most is a sense of consumer entitlement. If consumers have the right to share ebooks now, they’ll expect to have that right until the end of time. Never mind the fact that consumers share print books all the time. Since the sharing of books is apparently a bad thing, we can only assume that the ease with which consumers share printed books is a flaw inherent in the print format. Fortunately publishers can correct that flaw in the digital realm through the liberal use of oppressive DRM. I suppose this worldview shouldn’t come as a surprise. If the history of digital media has taught us one thing it’s that media companies see the digital future as an opportunity to exert extreme control over how consumers use and interact with content. In some ways, TOC Frankfurt was like every other TOC conference. The event brought together the usual assortment of publishing professionals, entrepreneurs, and thought leaders to discuss the future of an industry in the midst of a massive transformation. Over the past three years TOC has emerged as the go to source for publishers looking to expose themselves to innovative ideas and the cutting edge technology that is shaping the future of the book business. TOC Frankfurt differed from previous TOC conferences in a few notable ways, however. First, the event lasted just a single day, rather than the usual three. As a result, attendees got what might best be described as a concentrated dose of the TOC vision. Then there was the fact that the conference was being held in Europe for the first time. The Frankfurt conference had a distinctly more international feel to it than previous TOCs. And finally, there was the post-conference media coverage, some of which was less than flattering.